← Switch to Old fashioned Safety Razor and Save BIG and Get a Better Shave! Like a drug dealer giving out free samples, Gillette has been getting men hooked on Fusion razors by handing out free Fusion razors. You go along and you think, mm, this is a pretty good shave, and eventually you need to buy replacement cartridges, and it turns out they cost $40! Reader Jim got sick of spending $250 a year on cartridges for a shave that wasn’t stellar so he decided to kick it like a grandpa and switch to old-school double-edged safety razors. Jim says the blades on these just cost pennies a piece and the shave is cleaner and closer. 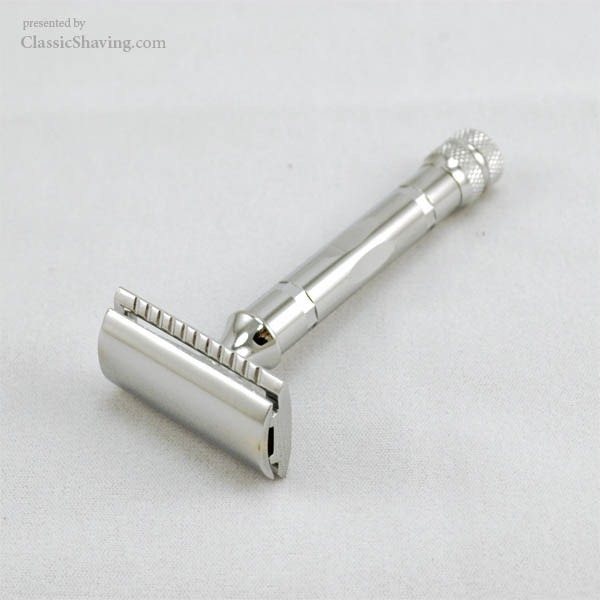 I went to the Classic Shaving website and bought this razor for $25.00. I bought 2 packs of blades. I bought the razor and blades FOUR years ago..I just used the next to the last blade! I have paid NOTHING to shave my legs all this time. And there is no better, closer shave!